Forget the 30-ish whippersnappers pulling down seven-figures for manuscripts about texting-obsessed millennials. Instead, focus on Lucy Hughes-Hallett, who, at 65, just published her debut novel. Though late to fiction, she’s no piker, having already won prizes as a biographer. In this new challenge, she chronicles the decades from 1663 to 1989 of Wychwood, an Oxfordshire estate, to create a dazzling historical novel with timely resonances for the Trumpian present. Her theme is walls: walls to exclude the undesirable, to insulate the favored, to separate classes, to divide countries; walls that rise, crumble, or are torn down. Such walls dominate a huge canvas populated by an abundance of characters. Fortunately, a dramatis personae offers a helpful guide, which contains four centuries of the estate’s inhabitants: aristocrats, laborers, visitors, villagers, Oxford classmates, even a witch or two, plus the dogs — descendants of the original Lupin and Wully and Dorabella. This large cast and considerable expanse of time demand a complicated structure and expert juggling. The author is up to the job. She has divided the novel into several sections, with different narrators, whose points of view range from first person to third. Their voices, some flowery and mature, others young and modern, are beautifully nuanced, the syntax appropriate to period, gender, class, and personality. The prose is uniformly gorgeous. .... Death, disease, betrayal, fires, and storms recur and wreak havoc. Still, love, joy, and humor also flourish. Treated to such a brilliant, ambitious mixture of actual history and creative invention, the determined reader will turn the last page rewarded, delighted, and eager for Hughes-Hallett’s next. Lest all this sound cold and mechanical, a wall’s social straitjacket also induces a certain vital energy, a desire to fling one’s arms apart, and this large and rich kitchen sink of a novel (as in everything but) is full of drama, vivid characters, wit, gorgeous writing and fascinating botanical, religious and social detail. Among its themes — and perhaps the most engaging one — is the decline of the great houses of England. We witness the estate of Wychwood being built, watch it survive fire and flood. We both applaud and cringe when it changes hands and becomes first a venue for the ’70s subculture, with its voluptuaries, dropouts, druggies and rock musicians, its wealthy patrons and hangers-on, and then, at the end, a “public show” with a little train that takes tourists on rides through the estate, a wildlife park, a craft center and garden shop and — the ultimate indignity — a television series whose measure of success is its sale to an American network. clever, many-layered... sophisticated and erudite... Ms. Hughes-Hallett is a natural heir to A.S. Byatt, delivering a densely patterned novel that shimmers with human interest as it probes our cultural story. Robert Frost might well be right when he says that something there is that doesn’t love a wall. Yet we keep on building them. 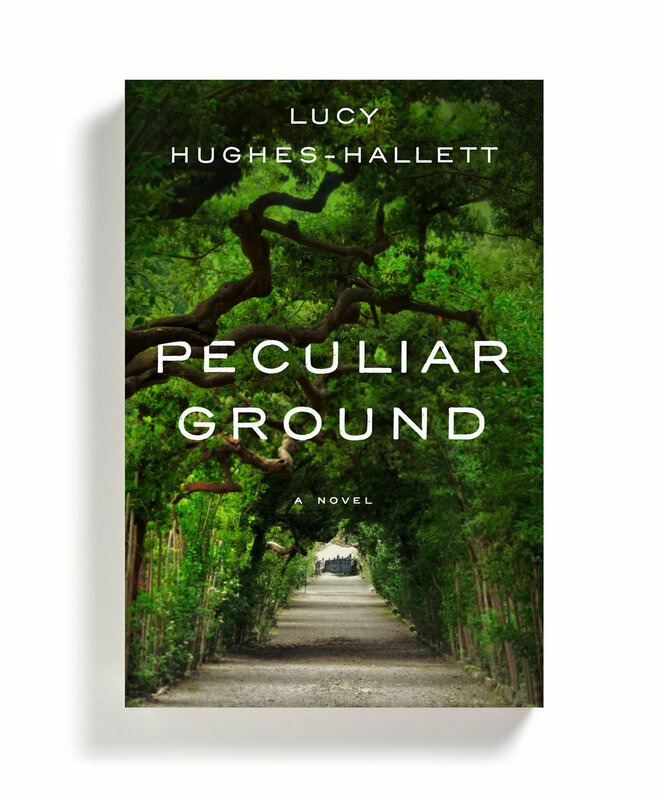 In her clever, many-layered debut novel, Lucy Hughes-Hallett casts a historian’s panoramic eye over human walls of every kind, from the biblical Jericho to postwar Berlin. “Peculiar Ground” begins in 1663, at Wychwood, the Oxfordshire estate of the Earl of Woldingham, where the landscaper John Norris is creating an elaborate formal park for his employer, hemmed in by a “great ring of stone.” Lord Woldingham has lately returned from exile with the restored King Charles II and associates the freedom to roam with danger: He now “chooses to be walled in.” The soon-to-be-gated community of Wychwood is a microcosm of the world outside, being home to a vast staff of gardeners, foresters, rangers, household servants and overseers. The aristocracy is at the apex of this miniature society, and a middle tier is represented by the newly emerging professionals: the architect Robert Rose; Lane the steward; and Norris himself. The world outside is riddled with sectarian and political tensions between Papists and Dissenters, Cavaliers and former Parliamentarians. It is not always kind to its women, who are sexually exploited, burdened with children and dressed in ridiculous fashions. England is also about to be visited by the Great Plague of 1665, in which some 100,000 people died. Plus ça change. No sooner have we found our bearings in 17th-century England than Ms. Hughes-Hallett skips forward confidently to the 20th century, to show us a 1960s Wychwood occupied by the parvenu Rossiters and their dependents and hangers-on: their niece Flora, who will later take charge of the estate; art dealer and Soviet spy Antony Briggs; and journalist Nicholas Fletcher. There is also interior designer Benjie Rose; his gay nephew, Guy; and even Nell Lane, a descendant of the house’s original steward. Ms. Hughes-Hallett is best known as the author of “The Pike” (2013), a biography of the Italian poet and provocateur Gabriele D’Annunzio. But she is also the author of two cultural histories, “Cleopatra: Histories, Dreams and Distortions” (1990) and a study of hero worship in Western civilization, “Heroes: Saviors, Traitors and Supermen” (2004). In this novel her observation of the societies of both her chosen eras, Stuart and present-day, is sophisticated and erudite. Modern-day Wychwood is a showcase for kitsch. Where the Earl and Countess of Woldingham projected an image of expensive solidity, Flora and her paisley-clad friends favor a trendy bohemianism (“teaching the rich how to make themselves and their houses look picturesquely rumpled”) that is no less contrived. It’s Flora, in the estate’s 1980s phase, who spots Wychwood’s commercial potential, marketing it as part of a vulgar TV show about English stately homes. But is this really so different from the garish pageants (including one depicting the fall of the walls of Jericho) which Lord and Lady Woldingham once put on in Wychwood’s grounds? In the breadth of her historical vision and her fastidious particularity, Ms. Hughes-Hallett is a natural heir to A.S. Byatt, delivering a densely patterned novel that shimmers with human interest as it probes our cultural story. When the sexual revolution begins, with its chimerical promise of liberation from biological realities, Nell gets involved with one of Nicholas’s protégés, falls pregnant (only to suffer a horrific miscarriage) and settles for a typically inequitable modern marriage fraught with the stresses of working motherhood. On the day the Berlin Wall is breached, her reporter husband is out on the street covering this turning point in 20th-century history while she,” the serious-minded civil servant,” is “in the ladies’ loo” wiping her daughter’s bottom. Guy and his generation, meanwhile, succumb to the new plague of AIDS. After the fall of the Berlin Wall, an apparently fresh threat to the West emerges when a Pakistani friend of Nell’s is placed under a fatwa for promoting the supposedly blasphemous book of a certain British novelist. “The story you’re all so worked up about is over,” he warns the Wychwood house party. “The story I’m part of is the one you need to think about.” The message is clear: Antony and his Leninist cronies are passé. Forget revolution and the Restoration: We are back to the Crusades. Even if this seems a bit too schematic, the author never shies from large themes, and usually makes the most of them. War, disease, internecine conflict, gender inequality, the divide between haves and have-nots, the march of progress that really isn’t progress at all—this, Ms. Hughes-Hallett’s sweeping novel suggests, is what we in the West have always had, and always will have. “Peculiar Ground” ends with a plangent vision of the Garden of Eden, fallen into feral wildness after the expulsion of Adam and Eve but still surrounded by a wall that “stretched away on either hand . . . as though to guard those within.” The John Norrises of this world will always do their best to landscape us. But in reality there’s no way out. An award-winning historian (Gabriele D'Annunzio: Poet, Seducer, and Preacher of War, 2013, etc.) makes her fiction debut with a story vast in scope but intimate in its details.The year is 1663. England's civil war has ended. Newly returned from exile, royalist Arthur Fortescue, the Earl of Woldingham, has hired the landscaper John Norris to turn his ancestral home into a private paradise. As he is drawn ever deeper into the life of Wychwood, Norris discovers that the Earl's plan to enclose his new gardens, fountains, and tree-lined avenues within a wall will be a disaster for the religious dissenters who live and worship in the forest around the estate. The Earl's land, Norris learns, is crisscrossed with secret paths used by people scorned and abused for their faith. When Hughes-Hallett brings the narrative 300 years into the future without first resolving this issue, the shift feels abrupt. But it soon becomes clear that the temporal leap makes perfect sense: the issue of the wall is unresolved because it is irresolvable. Who owns the land, who has right of way, what the very wealthy owe everyone else: these are questions that never go away. Hughes-Hallett explores how the past persists in other—more personal—ways as well. Relationships between masters and servants recapitulate themselves across generations. Family tragedies repeat with slight variations. Wychwood remains a world unto itself even as people come and go and the property changes hands. Time feels like a circle, and the novel brings us to 1989 before taking us back to the 17th century. There are multiple narrators and perspectives here, but the text never feels cacophonous because each voice is so exquisitely limned. Hughes-Hallett's choice to turn minor players into major characters is especially satisfying; of course those who rely upon the wealthy and powerful must be canny observers of the wealthy and powerful. The novel is a pleasure to read for the loveliness of its language. It's also a timely meditation on walls, on what they keep in and what they keep out. A first novel stunning for both its historical sweep and its elegant prose. The Costa Award–winning author of The Pike makes her literary fiction debut with a thoroughly engaging novel about people in two different ages but in one place. The times are 1663–65 and 1961–89, both periods of wrenching change. In 1663, good King Charles II is newly restored to his throne; the Puritans are ousted. In 1961, Puritan attitudes are taking it on the chin; even monogamy suffers. By 1989, another generation has taken over, homosexuality is no longer taboo, and the Berlin Wall falls. Dozens of people populate these pages, shaping the narrative, but there is another player. The great manor of Wychwood and its landmarks play key roles throughout. Family names persist across three centuries among the estate’s servitors and tenants. The many stories in this wonderful book are all variations on the theme of change and of the holding power of place over transient circumstance. Hughes-Hallett (Gabriele D’Anunzio) is a master storyteller. Her prose is a treasure—evocative, rich, engaging. VERDICT This book is already a hit overseas and will be here, too. History lovers, but even more, lovers of good fiction, will gobble it up. Hughes-Hallett effectively expands the domestic drama to touch on class resentment, religious conflict, and international affairs. Her Wychwood is a remarkable, ambivalent creation, “at once a sanctuary and place of internment,” and readers will delight at strolling its grounds under her guidance. Author of an acclaimed biography of the poet Gabriele D’Annunzio, Hughes-Hallet offers an enjoyable, sprawling epic debut about an enclosed paradise. Populated by a large cast, its subject is singular: Wynchwood, a lavish English country estate that weathers centuries of upheavals, from civil war to its transformation into a theme park for the aristocrat-obsessed. The novel concentrates on two historical eras. The 17th-century scenes, which bookend the novel, focus on John Norris, a prim landscape architect with extravagant Eden-like visions for the estate. Magnificent though his designs may be, the outside world creeps in, notably in the form of tragic accidents and the plague that ravaged England in 1665. These sections, which include flourishes of historical and cultural detail (witchcraft, folklore, secret religious sects), paint a vivid picture. The novel’s middle episodes, which check in on the fast-living set congregating at Wychwood during key moments throughout the Cold War, are the highlight: consistently witty, they are reminiscent of another country house saga, Alain Hollinghurst’s The Stranger’s Child. Hughes-Hallett effectively expands the domestic drama to touch on class resentment, religious conflict, and international affairs. Her Wychwood is a remarkable, ambivalent creation, “at once a sanctuary and place of internment,” and readers will delight at strolling its grounds under her guidance.